Stop the H8. Brussell sprouts are NOT yucky!! Stop the H8. 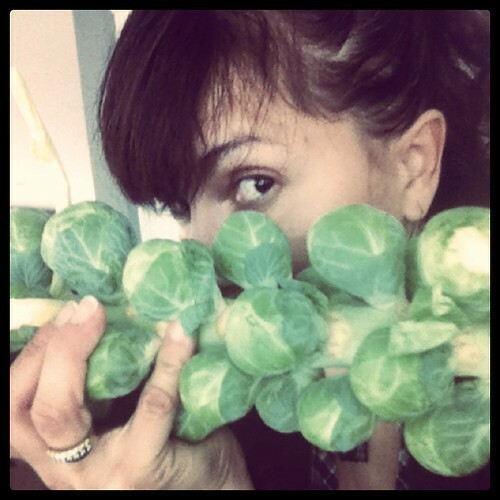 Brussell sprouts are NOT yucky! !, a photo by Angel Aviles McClinton on Flickr. I LOVE Brussell sprouts. I didn’t used to but I rediscovered them a few years ago and now they are a regular item on my menu. Love comes easy in this house. Picked off the stem, cut in half and in a marinade of olive oil, balsamic vinegar, salt, pepper and garlic. Oven-roasted for a few minutes… Yum! And, they are just soooo good for you.